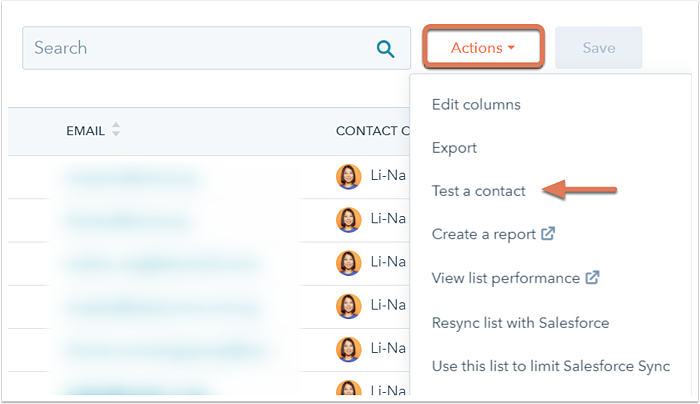 The Test contact feature allows you to check if a specific contact will meet your list criteria before you create a list, or check why a particular contact has been included or excluded from your list after it has been created. Click the name of an existing list or create a new list. In the upper right, click the Actions dropdown menu and select Test a contact. In the left panel, click the Testing Contact dropdown menu to search for and select the contact to test against the list criteria, then click Done. If the contact meets a set of criteria, the criteria will be in a green box. If the contact does not meet a set of criteria, the criteria will be in a red box. If you have multiple sets of criteria (OR rules), a contact who meets any of those sets, even if they do not meet the other sets of criteria, will be considered to meet the list criteria and will be included in the list. Learn more about AND vs OR list criteria.